This procedure is for inserting a new probe into the TT-AFM AFM and aligning the laser on it. Remove the probe holder cassette from the instrument and place it, upside-down on probe insertion base, see figure 1. Figure 1: Probe holder cassette in Probe insertion base. Open box with probes, next to probe insertion base. Use probe tweezers to move probe to “landing pad” on probe insertion base. With one hand, push down on cassette until brass spring rises a little (it moves less than one millimetre). 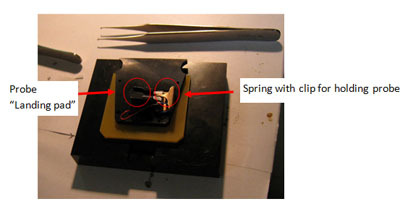 With your other hand, use rubber brush to move probe under spring, and then release. Check probe is seated all the way back in the slot. Lift probe cassette from probe insertion base, turn the right way up and slide into AFM instrument. If using a reflective sample, insert it now as it makes alignment easier. Locate probe in video microscope. This may be as simple as moving the focal plane of the microscope up and down using the wheel on the side. 10. If laser is not on, turn it on in AFM Workshop software. Also check, that motor is responding. 11. 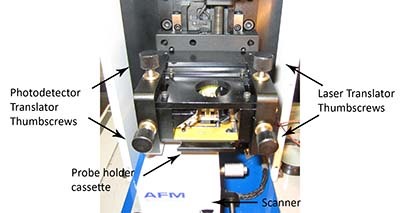 Align laser on probe using the two laser translation thumbscrews located at the top and front of the AFM head; see figure 2. 12. For details on alignment of laser see page 89 of Eaton and West. Get the maximum signal. 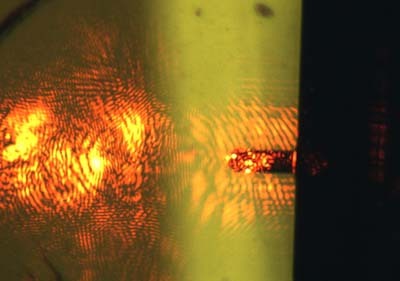 The laser may not look like a discreet spot, see figure 3. 13. You may not be able to get the top-bottom(T-B) and left-right(L-R) signals to zero, without reducing the Top+Bottom, the important thing, is that they should change when you move the photodetector translation thumbscrews. Get the T-B and L-R signals as close to zero as you can (ideally within 0.1V), without jeopardising the T+B signal to do so. This is all that is required, see the scanning protocol for beginning to scan. If either laser or motor does not respond, you need to turn of the software and ebox, then turn the ebox, then the software back on.